The reversible counter hammer hammer crusher is a crusher that can be positively and reversely developed on the basis of advanced foreign equipment. Applicable to cement, electric power, metallurgy, mining and other industries, such as: limestone, vermiculite, slag, raw coal and anthracite, medium and fine crushing and fine crushing operations. 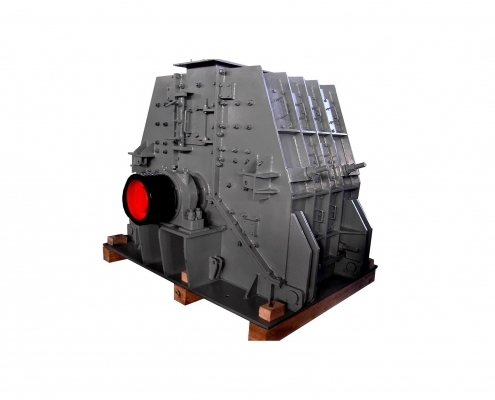 The compressive strength of the material is ideal below 300MPa, and it is equipped with hydraulic and mechanical adjustment clearance system to ensure the high degree of automation and safe operation of the equipment. The motor + fluid coupling (or driven by the pulley or driven by the reducer) drives the rotor rotating at high speed, and the high-speed hammer is arranged by the spiral suspension on the rotor, and the high-speed impact is fed from the upper part of the crusher. The material is directly cut into the joint between the hammer head and the wavy lining, and then hammered, sheared, squeezed, ground and pulverized between materials. The broken qualified material is discharged from the bottom, and the rotor can be positive and negative. Rotating in one direction, it takes one month to change the direction of rotation to ensure the symmetrical wear of the hammer head, which reduces the labor intensity of the workers and helps to improve the service life of the hammer head. It does not need to manually clean the cavity. 4, the crushing ratio is large, the wearing parts have a long service life (6-8 months), high efficiency, energy saving, and the use cost is greatly reduced.